Plans Of The "If We Told You, We'd Have To Kill You"
Back in the deepest, darkest depths of 1995, Major Rakal (the card) was the Coolest Thing Ever. Tal Shiar was the first regular skill added to the game, and she could solve the 40-pointer Quash Conspiracy all on her own (if you forget pesky things like dilemmas), there was a mysteriousness about it. That, and she was green, and I had an affinity for Romulans since my first Rare was a Romulan. A few years later, and the card shop I went to had closed down, and I knew that the Deep Space Nine set was coming out. I was staying with my grandparents quite a way across the country. We went out to another town for a day trip, and in the window of one of the shops there, was a poster for the DS9 set. I got them to stop (or possibly come back) so I could go in the store. I bought two booster packs of Deep Space Nine. One of my Rares was Elim Garak. Yep, I might just be able to find a place in my heart for the spoonheads. They might not quite get as much market share there as the Rommies, but not bad for a latecomer. The Treaty between those Intelligence powerhouses was promising, and how cool did those Plans cards look? By The Dominion, Tal Shiar and Obsidian Order was a strong skill to have. Earth was 40 points. Intelligence Operation was 40 points. The Order got the 40-point Bioweapon Ruse, and Bajor really wasn't all that bad, either. Then, in the Rules of Acquisition expansion, Tal Shiar got that free play engine. With this background, you can tell that I'm jazzed by some of the options that this set brings to the table. Intelligence is most definitely cool again. Today's card is Mutual Distrust. "Plays on your personnel (limit one each); target their Intelligence. Once each turn, when you play a personnel with different Intelligence, draw a card. (Cumulative.)" I like that this draw engine is cumulative, but the restriction of where it plays is a sensible one. You can't just stack lots of copies on one personnel and keep them out of harm's way: if you use lots of them then you will probably need to start risking them in mission attempts. J talked about Joint Operation in an earlier article, and this card totally complements a Joint Operation deck. Play it on your Obsidian Order personnel, and draw every time you play a Tal Shiar personnel. And vice-versa. 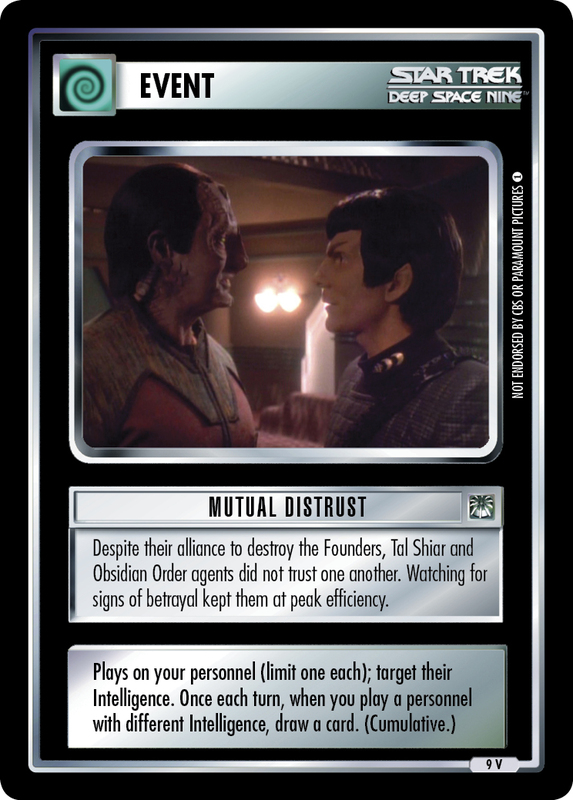 If you play Mutual Distrust on the new Enabran Tain, you get to choose to target either his Tal Shiar or his Obsidian Order ("target their Intelligence" on MD doesn't target all the Intelligences on the card - I had to check with the great and learned Rules Master about that one). Then when you play the Intelligence skill you didn't target, you get a draw. This could find Tain and Mutual Distrust a place in a straight Romulan or a straight Cardassian deck. It works the other way, too: if you already have Mutual Distrust on a Tal Shiar or an Obsidian Order and play Tain, you get a draw because Tain has the other one. The Cardassian/Romulan Treaty combo can be used with TNG, too. There are only two TNG Obsidian Order personnel (one universal), so you'll probably get more mileage playing MD on them, while you play lots of Tal Shiar. If you're including enough copies of Mutual Distrust to guarantee drawing into it early, then you might want to find ways to make sure you can use it early. A lot of Intelligence people are also Security, so Defend Homeworld is a natural pairing. With a DS9 Joint Operation deck, you could Defend Homeworld and Temporal Micro-Wormhole Luther Sloan and play Mutual Distrust on him. You're unlikely to get any more Section 31s, so each turn you get a Tal Shiar or Obsidian Order out, he'll get you a draw. If you're running TNG, you could do the same trick with Dexter Remmick. If property logo doesn't matter, try the same trick with Malcolm Reed: he has a built-in defense mechanism. Of course, although Romulans and Cardassians are the most plentiful sources of Intelligence, Mutual Distrust could find its place with other affiliations, too. Looking at the other Intelligences, there's a mainly-DS9 vibe going on. For FCA, there's Brunt and Nilva from DS9, and Krem from Enterprise. If you've got a Where Opportunities Are Made deck, and happen to be splashing in Lovok Founder and come across a desperate need for multiple Nilvas (Nilvae? ), Mutual Distrust could give you that little extra boost. Four of the people with Klingon Intelligence are from Deep Space Nine. Atul's even a Mission Specialist, so you can guarantee that he'll be there for you first turn. Bo'rak and Morka have pretty good skills in themselves, and Koloth... well, more on him in a little bit. Of the other Klingons with a bit of Intelligence, two are Second Edition Backwards Compatible (fingers crossed for a conversion of Meraht), Valkris is from Star Trek 3, and Arne Darvin is from TOS. Maybe one day we could get a DS9 version of him, as well. There's only one guy with Memory Omega. The 2e BC Intendant is the only BC card left with straight Intelligence. 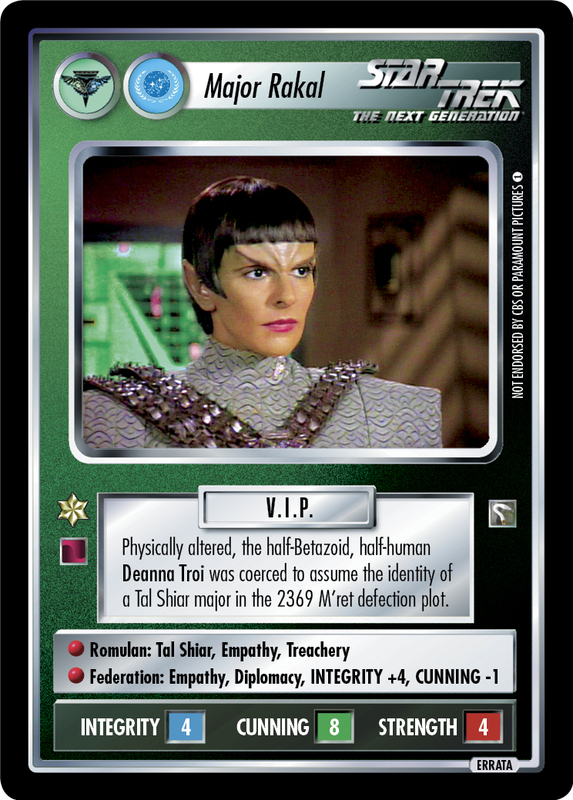 Apart from the Romulan/Cardassian Treaty decks, the biggest deck type that I can see making heavy use of Mutual Distrust is a DS9 Triple-Treaty deck. The DS9 Klingon Intelligence personnel are pretty solid, and Koloth strongly suggests using Blood Oath cards to round out the Klingon portion. There's no shortage of Tal Shiar for the Romulan portion. For the Federation section there's Sloan and Admiral Ross and Mirror Tuvok. You'll need more Feds to get the right proportions, Office of the President might be the best play engine for that. Flesh the rest of the deck out with whatever skills or ships you need. Run Earth, your Romulans and Klingons can solve it (don't forget the Espionage). For added fun use Writ Of Accountability to TMW in Brunt. Mutual Distrust. A simple-looking card, but very tricksy. My kinda fun. Some other Event-based draw engines (Traveler, Surprise Party, Kentucky Fried Chicken) give your opponent a benefit. Mutual Distrust doesn't. If you're stocking quite a few copies, or are running a few other Events as well, it might be to your advantage to stock a few Parallax Arguers as well. There's a lot to like here. How will you use this card?